Everio is very styling-conscious – so much so that it goes beyond just looking great, to pursue a design that provides superior usability. New detachable strap is designed to work as a grip belt when shooting and as a hand strap when carrying. Fashionable and comfortable. 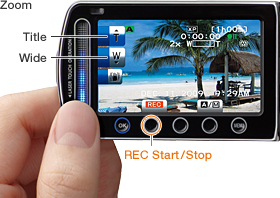 Touch-sensitive scroll bar and buttons for smooth operation (except for GZ-MS110). 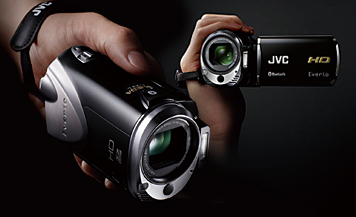 Allows zooming and recording using either the Laser Touch or standard zoom lever and REC button. Browsing through indexes and menu selection is easier than ever. Since you don't touch the LCD screen itself, you can keep the screen clean and fingerprint-free.